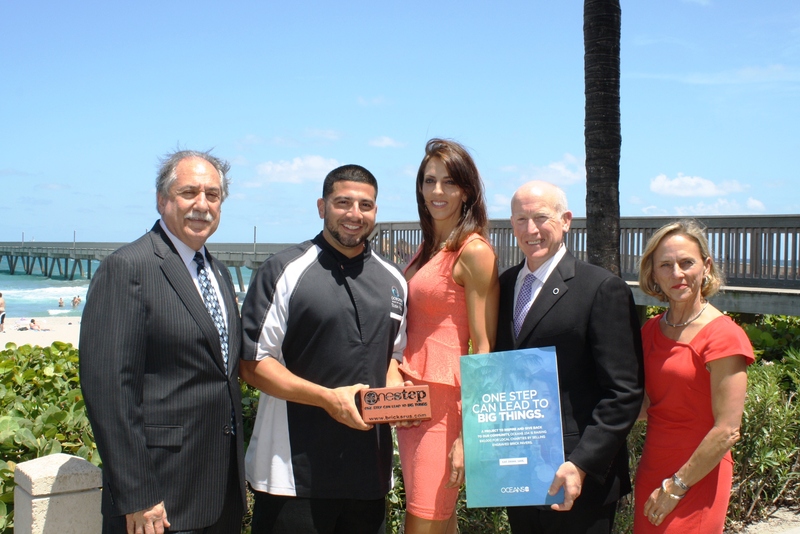 Oceans 234 (http://www.oceans234.com), a full-service, beachfront restaurant and bar, announced today the launch of its community based inspired ‘234 One Step’ engraved brick paver fundraising program dedicated to those who have taken the first step toward making an indelible change locally. Demonstrating that just ‘one step can lead to great things’, the program goal is to raise $50,000 to benefit and increase awareness for three area nonprofits and their vital missions: Deerfield Beach Chamber of Commerce community projects, Boys and Girls Clubs of Broward County and Broward Health Foundation’s ‘KIDS Campaign’. The One Step program kicks off online and in-restaurant on Tuesday, June 2nd followed by an official open-to-the-public launch party at Oceans 234 on Thursday, June 11th from 5:30 p.m. to 7:30 p.m.
will be inscribed as the donor wishes to show companywide support, honor a loved one, share a favorite quote, commemorate a special occasion or rally for a vital mission. Williams-Rosse reported that the 234 One Step paver program she conceived to fund community-centric missions for children’s wellbeing, healthcare and business and economic enhancement will be promoted and ease-of-donation accessible through several outreach channels. Featuring a custom dedicated program logo, there will be highly visible on-site components such as signage, menu and check inserts that are supported by an online informational campaign video, a dedicated donation page on the Oceans 234 website: oceans234.com/onestep, social media and outreach by each beneficiary. Oceans 234 is a full-service beachfront restaurant and bar with indoor and outdoor seating overlooking the Atlantic Ocean, located just steps away from the Deerfield Pier at 234 North Oceans Blvd. Serving up the freshest caught seafood and flavorful land entrees, the award-winning Oceans 234 is renowned for its creative and traditional culinary selections, picturesque oceanfront views, relaxed atmosphere, and superior service. Oceans 234’s menu by Executive Chef Victor Franco features fresh caught seafood varieties, a full sushi bar, tender steaks, poultry, entrée salads, handmade dessert menu, a full liquor bar and more. The restaurant serves lunch and dinner seven days a week and brunch on Sundays. For more information on the 234 One Step campaign, visit oceans234.com/onestep or call 954-428-2539 ext 3; for more info on dining at Oceans 234, visit http://www.oceans234.com. The Deerfield Chamber of Commerce is a business advocacy organization and exists to serve the needs of its member thorough its vision and mission that illustrates the broad, long-term purpose of the organization. It is the business membership organization of influence whose actions contribute to responsible economic growth and a better way of life for all people. Through the KIDS Campaign, Broward Health will be able to improve the children’s hospital facilities to match the expertise provided by medical teams. The Broward Health Foundation therefore launched a capital campaign to raise more than $20 million to renovate and expand the children’s hospital, in turn providing child patients and their families with many of the comforts of home so that their true focus can be on getting well. Every gift — large or small — to the KIDS Campaign will helps to expand and improve the patient rooms and playrooms to offer more space for children to play, to discover their new world within the hospital, to have fun, and to relax so they are receptive and cooperative to their medical care. Every gift helps provide parents with an environment to nurture their child, to discuss patient care, to laugh, to cry, to be together to help their child get well in an environment that is best-in class for comfort, security and efficiency. For more information, visit http://www.browardhealthfoundation.org/kids. Since 1965, it has been the mission of the Boys & Girls Clubs of Broward County to enable all young people, especially those who with the most need, to reach their full potential as productive, caring and responsible citizens. The goal is to provide world-class Club experience that assures that success is within reach of every child who walks through its doors, wanting all members to graduate from high school with a plan for the future, demonstrate good character and citizenship by participating in leadership training and volunteering in community service projects and engage in sports and activities that promote a healthy lifestyle. For more information, visit http://www.bgcbc.org.